A couple of months back , I wrote a post entitled Creating custom search boxes for library use. This is one of my top 10 most popular blog posts and also one of the posts which I’m most proud of because it is one of my few posts that I feel is pretty original. In that post, I figured out a way to create search widgets/boxes for practically any database, which can be embedded in many places including subject guides. 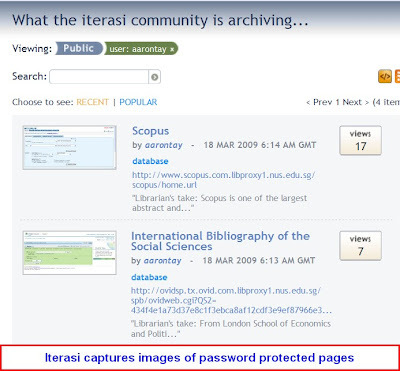 Firstly the example given on Scopus, no longer works as Scopus changed their urls. That of course is easily fixed. Secondly, I figured out a slightly better way to improve the stability of the widget. A more stable search widget? “I have being a big fan of Opensearch plugins since I discovered them and I even created a big bunch of them here for almost every database we support on various platforms. Once you have created a opensearch plugin, you know exactly what format the url should be sent to get the result. For instance, I know that to send a keyword query to EconLit (OvidSP) with the term TEST, you should send the following string. Both methods should work, but I’m told that the later string would avoid caching problems. Google reader has introduced two interesting features, “share” which allows uers to share interesting feed items to users who follow you on Google reader (or to the shared item page) and the newer “Send to” feature which allows you to send interesting feed items to be posted on various services including delicious, facebook and citeulike. These features are useful, particularly when reading full feeds of normal blogs where all information on the feed item is available within Google reader and the decision whether to share can be made immediately. But this isn’t the case for feeds of research alerts from say sciencedirect or a typical journal table of content feed. In most cases, you would need to go to the vendor site to read more before deciding to share. Even if one could tell just from the research alert rss feed item that the item is interesting enough to share, one would still typically need to click on the feed item to go to the vendor site to download the full-text, and to export to citation manager. So one would need to vist the vendor page anyway. I suggest that one can install Better GReader which loads the vendor page in Google reader itself. This allows you to work within Google reader all the time. 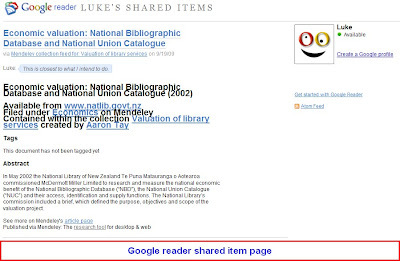 You can download full-text, import citations into your citation manager, share with users all without leaving Google reader! In a prior posts, I talked a lot about use of RSS feeds for research alerts, particularly in “Aggregating sources for academic research in a web 2.0 world“. The idea here was to use your RSS feed reader has a discovery tool, before importing it into your citation manager. The workflow would be as follows. 1. Click on rss feed to view what’s available. 2. If article appears to be interesting, click on it to go to the article on the vendor’s site, eg. 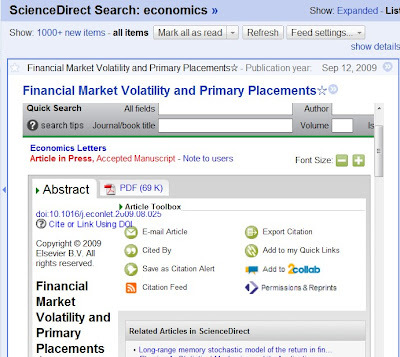 ScienceDirect, Web of Science etc to see full details. 3. Download the full-text. If you have not treated the RSS feed using the method I described here, you will need some method to handle ezproxy links (see post here showing 5 different methods). 4. Import the citation into your reference manager. This work-flow requires that you leave your rss feed reader to visit the vendor site and then carry out steps 3,4 there. But is it possible to actually do all that without even visiting the vendor site? Yes! You can handle all this within your rss feed reader without even visiting the vendor’s site if you happen to be using Google reader to read your feeds and in addition install Better GReader. Normally you would click on the title “Financial Market Volatility and Primary Placement” and a new window/tab would open and you would be brought to the vendor page. You can also export citations normally. Incidentally this works fine with Zotero’s normal citation export as well (click on icon in the url address bar). But what if you want to share the item with friends using other methods? You might want to share it on a bookmarking site like delicious, send to social networks like Facebook, or even to blogs like Blogger, Posterous etc. Normally you would use a bookmarklet, but as you might expect it doesn’t work here using this method. This is where Google reader’s new send to feature becomes useful. “Send to” feature allows you to send selected articles to various places from social bookmarking services like delicious, to blogs like Blogger, Posterous, to social networks like Facebook, MySpace, to microblogging platforms like Twitter and more. As the send to feature is customizable, there has being an explosion of ideas, with people using the feature to send stuff to Evernote, rememberthemilk addtoany, google bookmarks , sharethis and more here and here. 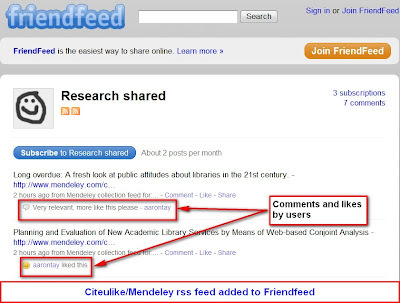 But possibly the most exciting is the ability to send to Citeulike – a free web-based citation manager. The instructions are here. 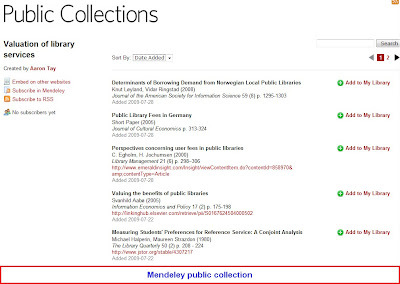 As Citeulike and Mendeley (another free citation manager which has both web-based and desktop versions) are collaborating this means it will link to Mendeley as well. So if you use either of the two has your citation manager, you have a quick way to send articles to them as well. Somewhat related is that you can share/share with note interesting articles with users who follow you on Google reader. which is a webpage that lists all your shared items. 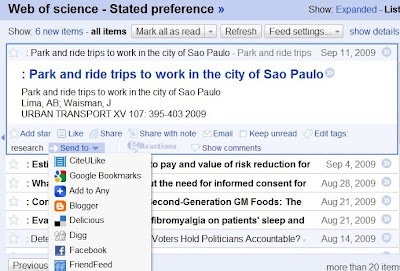 Sharing items and the ability to transfer items to citation managers etc within Google reader are very useful features, but as mentioned before the research alerts received via RSS are partial feeds, in other words, they show only some minimal information, and you would definitely have to visit the vendor page itself to get full information. Certainly you can’t download the full text from within your RSS feed reader, so you would definitely need to visit the vendor site. Similarly, chances are you would like to read the article first, before you shared with others. So ideally to take advantage of the two latest google reader feature, you would need some way to read the article (or at least look at the full details) on Google reader , without leaving google reader. And I just showed you how. 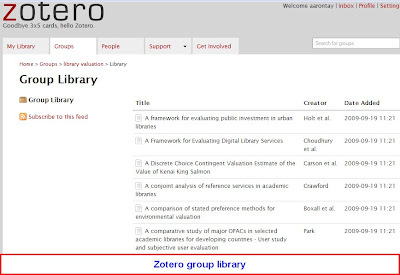 The idea of using Better GReader came from “sphoke” posting in the zotero forum. Web 2.0 services like Slideshare, Youtube are now an accepted part of the web, and Libraries are using them as a matter of course to embed their presentations onto webpages. However, updating these presentations, often involve a two step process, you upload your presentation on the service, then you edit your webpage with the html snipplet. If you need to regularly change the presentation that appears on your web page this gets old pretty fast. Is there a better way? The key idea here is to use widgets that are flexible enough that you can control what appears using tags without having to constantly edit the html of your page. By now, use of Slideshare (or alternatives such as Scribd, Issuu, Docstoc, Slidesix, Slideboom, Zohoshow, Myplick, Googledocs etc) to present documents (powerpoints, PDFs etc) is hardly considered innovative. 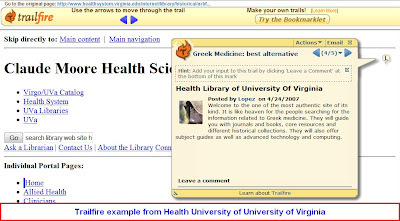 Libraries have embedded Slideshare widgets onto their webpages, subject guides (including Libguides or startup pages like Netvibes) and even wikis. 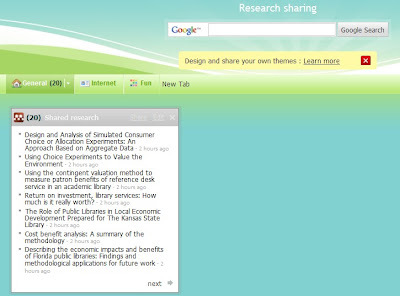 View more presentations from NUS Libraries. Several presentations in one Slideshare widget? This is how most people use SlideShare to embed their documents. But what if you wanted to embed several documents onto one page? For instance, you conducted several library tutorials for students in Sociology, and you want them all to appear. Sure, you could add one widget for each document but that would take up a lot of space. Can you put them all into one widget? Yes, you can. You can customize the documents that will appear in the Widget using various options, but for our purposes here is what you do. When you create the playlist or presentation pack widget, select “my tags” and in the pull down menu select ‘sociology’. Look at the preview below and if you are happy you can embed the html which will give you the result shown below. 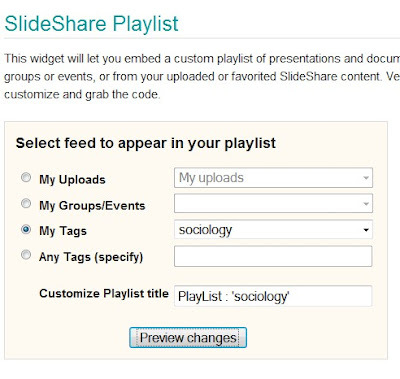 The widget above, packs all 4 documents uploaded by you onto Slideshare with the tag ‘sociology’. Initially, I found this a useful way to pack more than one presentation together in one widget, but later on I realized that this widget also was a great time saver. How so? The nice thing about the widget above is that as you change the tags given to the documents you have uploaded, it will update accordingly. So for example, if you decide one of 4 documents above is outdated, you can just go to that Slideshare document (click ‘edit’), remove the tag on the outdated widget and the widget will not show it anymore. Similarly, adding another new presentation is as simple, just upload the document to Slideshare , give it the correct tag and it will appear automatically! This is a great time saver as all you need to do is to work on Slideshare, change the tags on Slideshare and you don’t have to update the html on the page at all. Compare to the old way when you have to do a two step process of adding a presentation to Slideshare, then editing your html page and then uploading to your content management system. Moreover, some organizations might restrict access to the content management system, so in the past the poor guy with access had to constantly change the html on the webpage upon request. Using this widget, all he needs to do is to add the widget to the html once and upload on the server, and anyone else with access to the slideshare account can manipulate what appears by adding or removing tags. It’s a pity you can’t do this for the normal single presentation widget version of Slideshare. Or at least I haven’t found a good way, not if you still want to retain the older presentation somewhere. Would be nice if you could have a widget that always shows the latest presentation you uploaded, or you could indicate on Slideshare somehow that the widget would display a certain presentation (which you could change on the fly). You can of course create a presentation pack with one presentation but it’s not an elegant solution as the widget is meant for showing more than one widget. A common scenario for me is this ; I upload a presentation on SlideShare , after which I decide to make some changes to the presentation. As you probably know, you can update the presentation with the newer version by using the “Replace presentation” tab option. This will ensure the statistics for “views”, “favourites” , “embeds” will be carried forward. One bug I noticed is that, the widget doesn’t seem to display the newest version uploaded. Or at least it doesn’t do so immediately. Here’s a trick to get around the problem. To force the widget to update instantly, first remove the tag (“sociology” for instance) from the existing presentation. Then replace the presentation with your new version and add the tag. This will ensure that the widget will display the latest version of the presentation. I haven’t really looked at whether there are similar methods for widgets from Scribd, Youtube etc, though it seems you can embed your Youtube’s Playlist to achieve something similar. I’m sure there are many Flickr widgets that do something similar. The key idea here is to use widgets that are flexible enough that you can control what appears from the web 2.0 account without having to constantly edit the html of your page. Are there better methods? How do you update your widgets? Haven’t had much time to blog this weekend, as I was busy running a pilot survey for my Phd (more about that in the future), but I will just share 2 wild/random ideas I have about email. In my last post, I talked about how LibX is very useful, for acquisitions work, in particular how it can do autolinking of isbns. 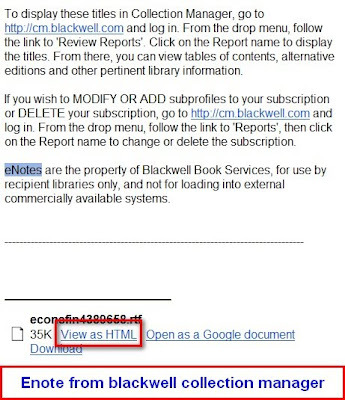 Say you subscribe to various book alerts like Blackwell collection manager’s enotes, and they send you attachments (rtf, doc) in email. On receiving them, you would like to click on the ibsns given in those attachments to do a direct ISBN search of your catalogue, but unfortunately the Libx autolinking of isbns works only with actual webpages, so getting them in rtf, doc format doesn’t help. What’s the solution? What you can do is to subscribe to those mails in your gmail account, then when the mail arrives click on “view as html”, which will open the document as a html page. Why do so? Simple, so LibX can work its magic. Now just click on the isbn and you can do a isbn check of your OPAC! Google’s “view in html” works for not just Word documents but also excel, pdf, ppt etc. A common thing often done is to search for a bunch of items from your integrated library system (ILS) using a certain search criteria (say all items catalogued last year and circulated at least 5 times), then export the results (which will almost always include isbn or Marc field 020) into excel. 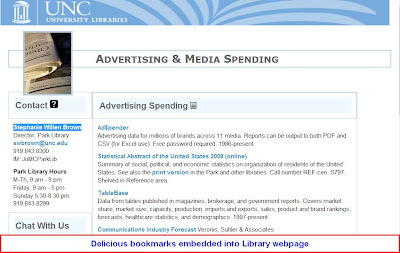 But if you want to look at those items you would have to manually cut and paste the isbn etc into your opac to search. Instead, email it to gmail, then use the same trick above, and you will see all the isbns are links already! Another interesting option would be to view/convert such documents in Google docs or one of their competitors (Zoho, Buzzword, etc), since they are web-based with the corresponding benefits. In fact, besides the LibX functions there are several functions that are accessible only when viewed in html, these include IE 8’s web accelerators, various Firefox addons that add searches to the context menu etc, so viewing a document in html can actually be quite useful. Many libraries use a Outlook account to handle user queries. 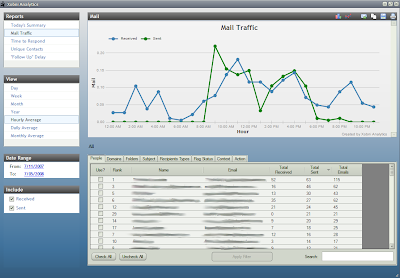 By using Xobni (Inbox spelled backwards) a free plugin, one can access Xobni analytics, which helps to quickly answer the following questions. In terms of mail volume, when are your users emailing you. How many percent of them email you during the weekend? How many percent do it after office hours? Does mail volume vary across the year? In terms of response speed, what is your libraries’ median response time to a mail? Does this vary much by hours? (Typically it does, mail received before office hours say 7 am obviously have a slower response time). Does this vary by day of week or across the year? (Again it is obvious response time is typically slower during week-ends if the account isn’t manned those times). Are you meeting your service level targets? All this is very helpful to decision making, for example if you find a spike in emails received after midnight say during April (just before assignments are due? ), you might consider setting up a night shift to answer emails during this period? Is your response time noticeably slower for certain questions? Particularly, you might find a class of questions that are commonly received say after office hours or on friday nights and which require answers that cannot wait until office hour begins… Which could be a source of dissatisfaction. Xobni also has Facebook, Linkedin and Skype integration. 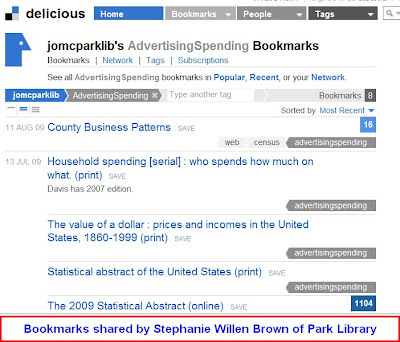 With many libraries establishing a presence in Facebook, (even Library of Congress has one!) due to the rapid rise in popularity of Facebook and a smaller number providing support via Skype, Xobni is the ideal tool. For instance, a user emails you to ask a question, use Xobni to instantly offer to “Friend” him with your Library’s Facebook account. Or instantly find his skype account and communicate with him via Skype. 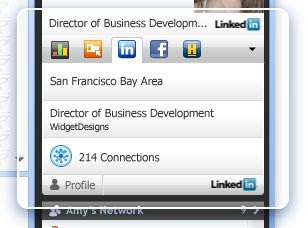 Note : There might be privacy concerns if you use Linkedin, Facebook related features. That’s all for this week. I hope you found some of the tips here useful. BTW, my blog is now 6 months ago (it’s genesis dates back to 24 Feb 2009) , would like to thank readers for their comments and interest.